See also Propeller Aero’s ground-control points aim for UAV accuracy. Drone-maker DJI has partnered with UAV software company Propeller Aero to launch an integrated solution to reduce costs, improve safety and drive operational efficiency in the construction and mining industries. The partnership integrates DJI’s commercial-grade aerial platform, the Matrice 100, with Propeller’s cloud-based software specifically designed for surveying and inspection. The solution provides enterprises and commercial UAV operators a simplified, quick and efficient way to automate operations and access data. It will enable businesses to accurately perform site measurements and volumetrics and share data seamlessly with just a few clicks, the companies said. They set about joining Australia’s regulated drone industry by applying for their drone pilot licenses. While waiting for the paperwork, they created an online app to share data from their trial flights. Figuring out the best ways to process, visualize and use UAV data ended up being more exciting to San Miguel and Vierboom than actually flying the drone. Propeller Aero provides cloud-based software that streamlines data processing and simplifies the way data is used and shared. The software package provides web-based geospatial data processing, analytics and instant volumetric calculations for a range of professional applications. 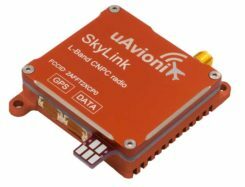 It has been adopted by commercial drone operators and enterprise clients in 60 countries. Deploying UAVs for surveying and inspection can reduce costs, minimize workplace hazards and improve operations, especially for businesses that operate in quarries, construction sites and asset infrastructure. “Being from Australia, Propeller Aero has had the considerable advantage of developing alongside the industries that have been using commercial UAVs since 2002,” said Michael Perry, DJI’s director of strategic partnerships. DJI’s Matrice 100. 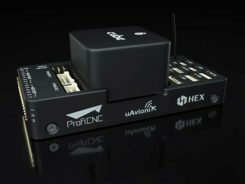 The Matrice 100 platform has DJI’s technology built in, including GPS, the flight controller, the propulsion system, DJI Lightbridge, a dedicated remote controller and a rechargeable battery. The system automatically manages complex tasks required for flight.